But we know keeping track of all the “terms” can be a daunting task. What exactly does an enzyme do? What the heck is a polysaccharide? Ah! The terms can really start to pile up. The process by which molecules move from the gastrointestinal (GI) tract into the circulatory system. A nitrogen-containing organic constituent found in plants. Alkaloids promote healthy functioning organs. Neutralizes free radicals (i.e., unstable oxygen and nitrogen by-products that can damage cell DNA, lipids, and proteins). Check out our webinar on this topic here. The building blocks of proteins. Complete proteins or high biological value foods contain all essential amino acids, such as animal-based proteins (e.g., meat, fish, poultry, eggs, and dairy products, among others) and some vegetable proteins (e.g., soy, buckwheat, hempseed, and quinoa). Foods that do not contain all the essential amino acids (i.e., is limiting in one or more of these essential amino acids) are referred to as incomplete proteins or of poor biological value. A compound producing natural bowel movements, thereby relieving constipation. The main source of the body’s energy. Think of carbs as gasoline for your car; they give you the energy to move. Found in many foods such as bread, cakes, pasta, grains, fruits, veggies, and dairy. Chemically, carbohydrates are combinations of carbon (C), hydrogen (H), and oxygen (O). The basic formula is: CnH2nOn. One or more molecules of simple sugars make up all carbohydrates. A complex lipid that is synthesized by hepatic cells and derived from animal sources, not plant sources. The body requires cholesterol to function; however, too much cholesterol causes a build-up in the arteries known as plaque. Cholesterol is carried to the blood via lipoproteins (low density lipoproteins [LDL] or high density lipoproteins [HDL]) and does not dissolve in the bloodstream. Carbohydrates that consist of two monosaccharides (e.g., glucose, galactose, fructose), which are joined by glycosidic bonds. Examples of disaccharides include sucrose (glucose + fructose), maltose (glucose + glucose), and lactose (glucose + galactose). The act of dispersing two immiscible liquids (e.g., fat and water), resulting in an emulsion. A protein that speeds up (i.e., catalyzes) reactions. Simple lipids required from the diet (hence, they are “essential”). Omega-3 and omega-6 fatty acids are essential fatty acids. A complex carbohydrate (i.e., a polysaccharide) that consists of cellulose and hemicellulose. Compounds that result from normal metabolic processes and immune responses. However, free radicals can also be caused by environmental pollutants and stress. Excessive levels of free radicals or free radicals in the wrong place can damage the body’s own cell membranes, proteins, and DNA. A monosaccharide (simple carbohydrate) present in most fruits and some vegetables. Apples, raisins, kiwis, grapes, green beans, cabbage, cucumbers, eggplants, and tomatoes are some of the best sources of fructose. Fructose should be consumed in moderation; the healthiest sources are fruits and vegetables. The most prevalent monosaccharide in our foods. It is commercially produced from cornstarch that has been treated with heat, acids, and enzymes. It tastes less sweet than sucrose. One teaspoon has 16 calories. A pancreatic hormone that stimulates the uptake of glucose by body cells. A polyunsaturated omega-6 fatty acid. Linoleic acid is an essential fatty acid. A complex made of lipids and proteins that transports cholesterol, fatty acids, and triglycerides from the liver to body cells and vice versa. Examples of lipoproteins include very low-density lipoprotein (VLDL), intermediate density lipoprotein (IDL), low-density lipoprotein (LDL), and high-density lipoprotein (HDL). A term that comprises proteins, carbohydrates, and lipids. Reactions that take place once a nutrient has been taken up by body cells. 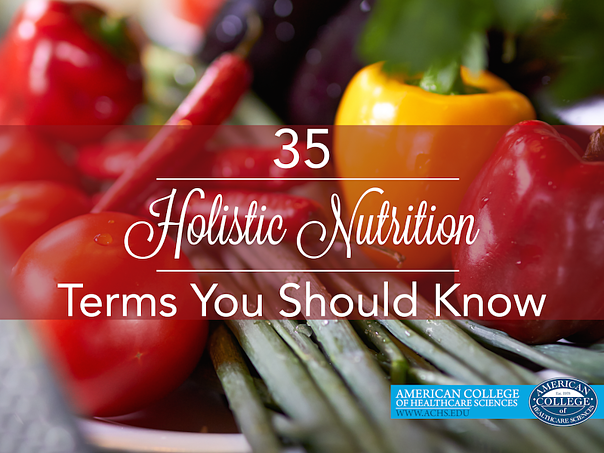 A term that comprises vitamins and minerals. A micronutrient that is needed in the human diet. Minerals are divided into macro- and micro-minerals depending on the daily requirements. Examples include iron, magnesium, and zinc. Smallest building blocks of carbohydrates. Monosaccharides, which are simple carbohydrates, include glucose, galactose, and fructose. A compound that is required for growth and development. A type of lipid that is structurally similar to triglycerides. Phospholipids consist of one glycerol molecule attached to two fatty acids and one phosphate group. A complex carbohydrate. Examples include starch, fiber (cellulose and hemicellulose), pectin, carbohydrate gums, and glycogen. Essential for growth in animals, proteins are molecules that are composed of one or more chains of amino acids and contain hydrogen, nitrogen, oxygen, and sulfur. Proteins are often found in legumes, meat, fish, eggs, and dairy. A type of triglyceride that consists of fatty acids saturated with hydrogen (hence the term “saturated”), and are commonly solid at room temperature. A compound that tones and strengthens the stomach. A type of disaccharide (a simple carbohydrate). It consists of a molecule of glucose joined to a molecule of fructose. A type of lipid that is structurally similar to phospholipids. One glycerol molecule attached to three fatty acids makes up a triglyceride. A type of triglyceride that consist of fatty acids that are missing hydrogen atoms (hence the term “unsaturated”), and are often liquid at room temperature. An organic non-energy yielding compound that is needed in small amounts from the diet. Dorene Petersen is the Founder, President, CEO, and Principal of the American College of Healthcare Sciences (ACHS). She has over 35 years clinical teaching and lecturing experience in aromatherapy and other holistic health subjects. She has presented papers on essential oils and clinical aromatherapy at the International Federation of Essential Oils and Aroma Trades Annual Conference (IFEAT) in California, USA; the Aroma Environment Association of Japan (AEAJ) in Tokyo, Japan; the Asian Aroma Ingredients Congress (AAIC) and Expo in Bali, Indonesia; the International Center of Advanced Aromatherapy (ICAA) at the WonGwang Digital University in Seoul, Korea; as well as the AAIC Expo in Kunming, Yunnan, China. Dorene currently serves as Chair of the Aromatherapy Registration Council (ARC), and she is also active with the Distance Education Training Council (DETC). Dorene is a travel junkie, and she hopes you will join her for the ACHS Study Abroad Program in Greece this summer. ACHS faculty member Dr. Paz Etcheverry obtained her M.S. degree in Food Science and Nutrition from North Carolina State University in Raleigh, NC, and her Ph.D. in Food Science and Technology from Cornell University in Ithaca, NY. She became an instructor and maintained her own research laboratory. Paz focuses on teaching undergraduate- and graduate-level nutrition courses and enjoys being a freelance science editor and nutrition/medical writer. When not teaching or editing manuscripts, Paz enjoys her lifestyle in sunny Florida with her family and Lola, a black-and-white Boston terrier.